When it comes to style moves, Sonam Kapoor has it down to a science. And she is a fashion icon who always looks on point. Her effortless style, love for experimentation ought to follow for a winning look. But how does she do it? We dissected a few of her best outfits – all in the name of dressing better ourselves. Take notes. Take inspiration from the style icon’s book and give age-old silhouettes a modern-day update. Style your sari with a sheer cape, cropped blazer or embellished floor-length jacket. Sonam in sari always steals the glance and impresses the crowd with her simply perfect silhouette look. If you’re embracing this modern trend, make sure your saree is plain and simple one. Ruffling up curls with your tresses is the key to sport a look like Sonam Kapoor. You could also think messy buns, fierce ponytails and everything in between. Step 1: Pull your hair into a high ponytail on top of your head. Step 2: Separate your ponytail into three or four equal-sized sections (depending on how thick your hair is), and wrap each piece around the iron for ten seconds. Step 3: Let your curls cool in the ponytail while you finish getting ready, and just before you head out the door, let it all down and give your hair a good tousle to break the curls apart. Be it a sheer bolero over your sari, a lace cardigan over a summer dress or a silk coat over your couture, this styling tip is just fab! Admittedly this is a tough trend to pull off. But if you’re going for it, make sure you do it right. 3. You can stick to the black and white looks as shown, but you can also use any other color combinations. Nothing screams boss lady like a pantsuit! Follow the Kapoor fashionista’s lead between monochrome, pinstripes and fuss-free prints for maximum impact. 5. Wear whatever the hell you want! 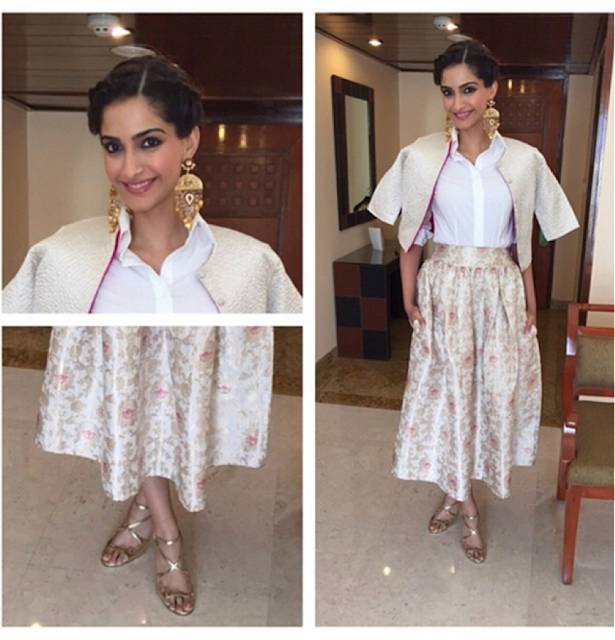 One thing Sonam Kapoor does best is owning her ladylike aesthetic and having fun with fashion. And most importantly, playing dress up shouldn’t be a chore. If you’re comfortable and having fun with fashion, your outfit will be far more memorable. Do you know of any other ways to dress like Sonam Kapoor? Sound off below!